above photo;. 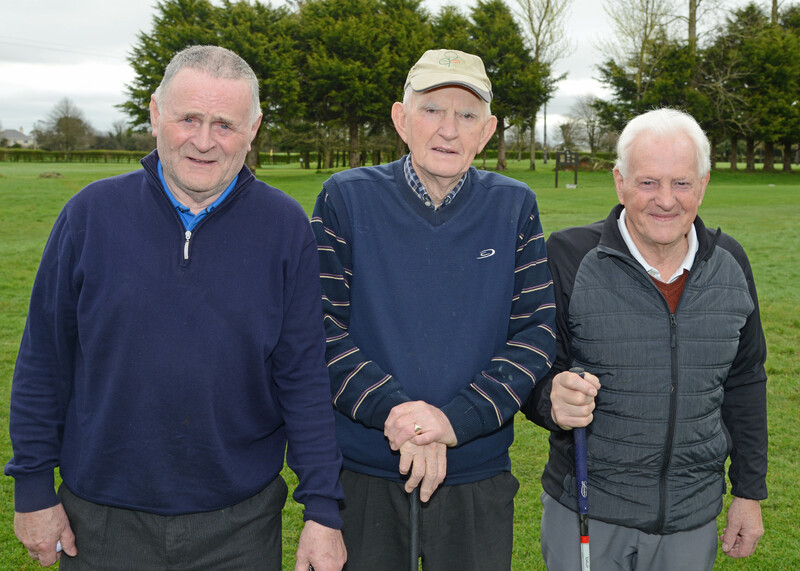 Templemore Golf Club Open Seniors Competitive Golfers. L-R. Bertie Keane, Mick Connell, Eddie Butler. (Photo by; Seamus Bourke). Saturdays & Sundays Competition; The 18hole Stableford on Saturdays and Sundays commenced on Sat. 30th. March. The course is in excellent condition, all are invited to take the opportunity of playing on this fantastic course. J.B. Carr Team . Team selection to this great tournament will take place shortly. The 1st. Leg. is away, Tipperary -V- Templemore, to be completed no Later than Tuesday April 23. Contact Team Manager; Liam Leahy. 087-4115773 if you feel you should be on the selection list. New “Cadet” Section; Templemore Golf Club is establishing a NEW Cadet Section in liaison with the Confederation of Golf who act on behalf of the Golfing Union of Ireland (GUI), the Irish Ladies Golf Union (ILGU) and the Professional Golfers Association (PGA) as the development organization for “Cadet” Golf. With ageing Club memberships and the overall decline in golf participation, junior members have never been more important to the future of Golf Clubs. Similarly, never before have children had more variety and opportunity in terms of activities, all competing to occupy their spare time and attract their talent. These factors present a challenge for golf to improve its ‘offer’ to young people and encourage them to start and stay in the game. In the past, Cadet Golf did not require a great degree of care and attention from club management and officials as junior recruitment appeared to be relatively “easy”, especially for boys. Today, the role of the Cadet Committee will be regarded as the most important one in the Golf Club, including liaising with adult leaders, coaches, junior members, parents/guardians, ILGU, GUI and CGI officers and local schools. This will be a great advantage to the future of the club. More details will be announced as development proceeds. New Beginner Golfers. There is a “Special limited Fee” for beginners which is guaranteed not to change for 3 years. This is very attractive for anyone interested in joining and for those purchasing vouchers to give a life changing experience to someone. New members are now been accepted. The membership categories have been increased to suit all sectors of the community. All current members are encouraged to introduce at least “ONE NEW MEMBER” Lady or Gent, Junior or Student, Seniors Juveniles and Family, Active Retiree’s, Special Needs or any person interested in taking up the sport. It will be a huge advantage to building the club membership and profile. 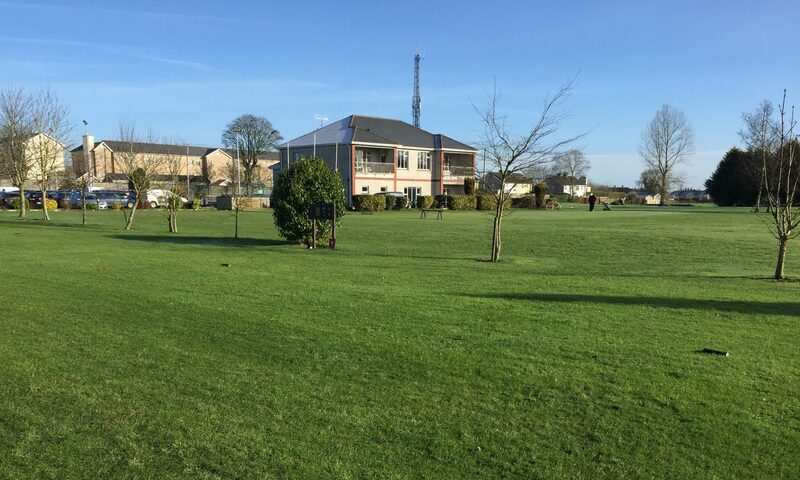 Welcome Back to Lapsed Members; There is a great return by Lapsed members and all are Welcome Back; A special rate for “Lapsed Members” that have not played/joined for “One Year” can avail of a “welcomed back” once-off, special rate of €200 and Ladies €170. This is a great motivation opportunity for golfers, Ladies and Gents who want to return to this great social game. All current members are encouraged to promote this offer to help those that want to return to the Club. Registrations Forms are now available on-line on our web site, just select the “Membership” tab and it will give you the option to pay by Pay Pal or Credit Card. or collect an application form at the club house or contact Martin Bohan 087 0509278 or any of the committee members. Payment options can also be made through the Golf Club web site link; http://templemoregolfclub.ie/membership/ All will be more than welcomed. Course Development Donations/Sponsorship; Donations, sponsorship, will be greatly received and used exclusively for Course Development. Put your stamp on the course making a special contribution. For Donations, Just select the “Membership” tab and then select “Make a Donation” tab on the Club Web Site http://templemoregolfclub.ie/membership/ , or in confidence contact; Martin Bohan 087 0509278. The Seniors; Thursday March 28th. The Course is in fantastic condition which resulted in great scoring. Winners; The winners for Thursday 28st were; 1st. Team; George Murry, Michael Carey, Liam Leahy, Pat Maher, . 2nd Team; Ambrose Purcell, Ollie Murry, Pascal Whelan, Mick Carey. 3rd. Team; Gerry Keegan, Paudie Grace, John Galvin. Next Seniors; Thursday April 2nd..
LMC; The start of the LMC is this Monday March 2nd. at Roscrea. Spring League; 4th.. leg. To continue until further notice. Saturdays & Sundays Competition; The 18hole Stableford on Saturdays and Sundays commenced on Sat. 30th. March.